Whether it be for a recently born child or an adult come to faith, we would be delighted to arrange a service of Holy Baptism for you, often called a Christening. Services at Christ Church usually take place on Sunday mornings at 11.15am (St Oswald’s, Newton by arrangement) and we try to ensure a meaningful and enjoyable service for all. We try and include the Godparents or family members in the service by inviting them to to a reading or a short prayer. It's nothing to be frightened of, and you can see the Baptism Prayers here. 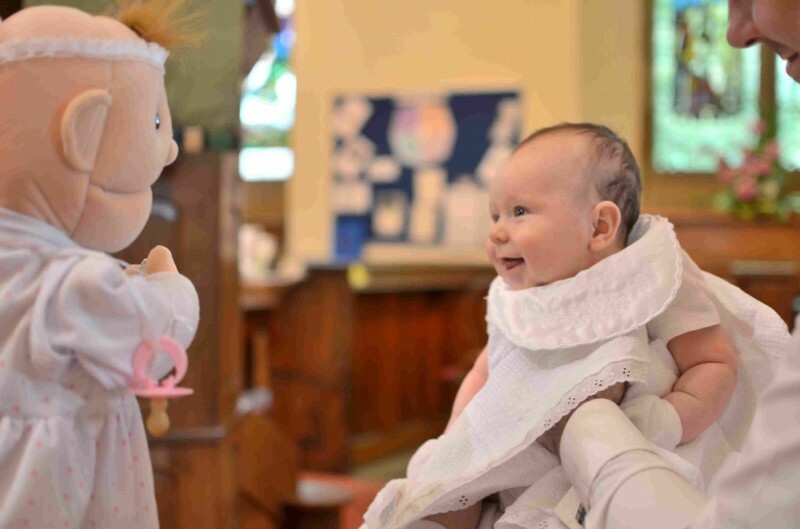 Baptisms can also take place in the summer months at the 12th Centrury Church of All Saints on Low Green - just ask when you see the clergy to book in. We welcome people too at Saint Oswald's Church at Newton under Roseberry. Please contact teh Vicar for details. Sometimes it is not always possible to gather everyone together for a baptism service as people live all across the world. In Christ Church we have an internet link and can link people togather across the world. We try and make a Christeng service meaningful for all present, and especially the young who may find coming into Church a strange experience. Here is Jessica, the Vicar's "daughter" explaining what being Christened is all about to baby Jake. If you are interested, please get in touch. There is always a member of staff available in person to talk to on Friday evenings from 6pm – 7pm in Christ Church vestry.